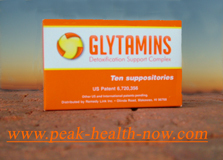 The Glytamins formula created by Spencer Feldman, scientist and company owner is a brilliantly effective blend of select ingredients with synergistic benefits to support increased efficiency of liver, gallbladder and kidney function. Because this product is not only highly effective, but very gentle and safe, it has a wide variety of applications. Many of my coaching clients have suffered mercury poisoning or other major insults. 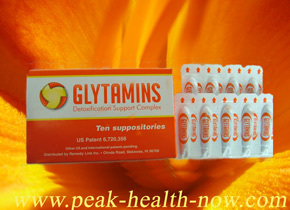 They are VERY sensitive and need to go slow with detoxification. This product has proved gentle enough even for the most sensitive people. 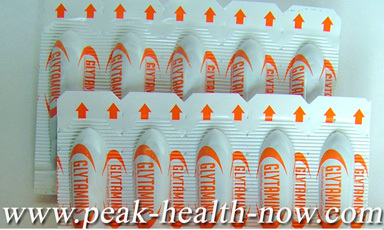 I have received many delighted comments on Glytamins therapeutic power. Kudos have come from clients who used it at the 'eleventh hour' to get out of trouble, AND from healthy people who use this liver gallbladder support supplement to maintain Peak Health. These excellent detoxification support suppositories are a stand-alone product that effectively flushes toxins out of liver and kidneys. In addition, the herbal extracts richly nourish these organs and primes them to speed the elimination of bile sludge, gallstones, heavy metals and other toxins. This helps you minimize or avoid Herxheimer effect - detox reaction and symptoms. Gallbladder Flush the Easy Way! Is Enema a Good Idea the Morning After a Suppository? Buy Glytamins: FREE Shipping / Save $120.00 on Larger Orders!